April 18, 2012 By Paul Mayer & filed under Shop Tips, Skill Building. Where the proverbial “rubber meets the road” in dust collection is where the ductwork ties into the tool to extract dust while the tool is in operation. In my opinion most tool manufacturers treat dust collection as an afterthought, and do not design the tools to provide adequate removal of dust and debris. To put it simply, the ports are generally too small and poorly positioned, thereby leaving most of the microscopic dust particles hanging in the air where our lungs become the dust collection system. Therefore, if we want to take full advantage of our powerful dust collection system and optimized ductwork, we need to give some extra effort in the final connection to our tools. This means modifying or replacing the dust ports on some tools, and creating a dust capture mechanism from scratch in other cases. Be judicious here and your efforts will be rewarded with clean air. If you take the easy route and just accept what the tool manufacturer provides for dust collection, you may have regrets. 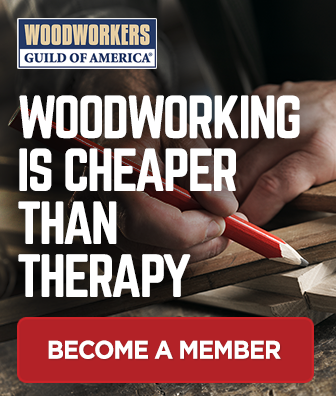 This article is by no means a definitive guide, but rather a tour through my shop where I will show you examples of how I have connected various tools, and in most cases made huge improvements over what came “in the box” with each tool. You can use these ideas as a starting point, and come up with some great ideas of your own to maximize the dust captured at each tool. Tool ports. Before I jump into the tour, let’s take a look at an example of how to make custom tool ports. I have seen several different approaches, but I like this one because it is simple, cheap, sturdy and works well with PVC couplers that I use as quick disconnects at the end of flexible tubing. Ideally you will place a 6″ port as close to where the dust is being produced as possible, and I have never purchased a tool that had a standard 6″ port, or even an optional one for that matter. So, you will have to make your own ports, and in some cases, cut holes in your tools to accommodate the port. The picture shows a shop made 6″ port on a jointer, with a drill stuck in it to illustrate the massive size. That port allows massive air movement, and allows my dust collector to pull everything that is not securely attached to the tool. Simple to make. Take a 6″ piece of PVC, set it on a piece of plywood or MDF, trace a line around the outside of the pipe, and cut the hole. Set the PVC in the hole and caulk it on the outside. Then place 1/4″ foam weather stripping around the perimeter of the plywood, and use sheet metal screws to attach to your tool. If the stock port opening on the tool isn’t large enough, or isn’t there, use a jigsaw with appropriate metal cutting blade to modify or create the opening. Tool hookup examples from my shop. Table saw. I replaced the stock 4″ port with a shop-made 6″ port, and ran a short section of 6″ flex hose to the tool. Mine is actually a poor example because I only capture dust from the cabinet of the saw. After upgrading to a larger dust collector I now have adequate suction and I plan to add an over arm guard with dust capture. At least I have a 6″ port at the cabinet, and with over 1300 CFM it keeps the cabinet and its contents clean. Jointer. I simply built a 6″ tool port with quick disconnect as described above and it does a great job. This is my longest duct run with the lowest CFM measurement of any 6″ port, and it still does a great job collecting dust and debris. By expanding to a 6″ port over the stock 4″ port that came with the tool, I see a massive improvement in air movement at the tool, and the upgrade took only about 30 minutes. Router table. Here I have a 4″ port integrated into the fence, and another 4″ duct extended into the cabinet right near the router. This captures a good amount of the dust, but I believe that I will modify this to use a 6″ duct in the base which should be a great improvement. Also, it is a good idea to have the lower port set 6″ or so from the router to allow proper cooling of the router. 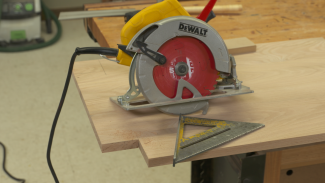 Sliding Compound Miter Saw. Here I ran a 6″ port from below into a shop made hood, and ran a short section of hose off the tools dust port, directing that dust toward my duct. This is perhaps the hardest tool to capture dust from, especially for sliding saws, so you will want put some thought into this one. I would see some incremental improvement by running another dust port directly underneath the bed of the saw where I still have a small amount of dust escaping collection. You will want at least 1000 CFM at this tool, and ideally 1300 or more, since you are producing dust up to 2 feet away from the port at times. Drill press. I simply used the 4″ port that came standard with one of my other tools (which I upgraded to use a 6″ port), and used a bungee cord to attach it to my drill press. I probably wouldn’t bother hooking my drill press up to dust collection for typical drilling operations because drill bits do not send a lot of fine dust into the air, but I occasionally use it with a small drum sander in the chuck, so this setup works great for that application. An easy improvement here would be to add a second 4″ line to capture dust from the other side of the drill press, but the current setup captures the majority of dust and shavings. Planer. I ran 6″ pipe all the way to a tapered reducer to 4″ at the very end of the line. 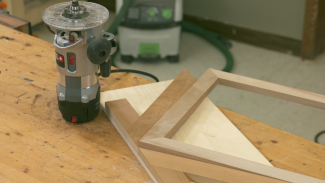 I would rather have a 6″ connection to the dust pickup, but because a planer is well enclosed to contain the dust and debris, this setup works well for my 13″ planer. For larger planers I would likely configure a 6″ port or dual 4″ ports. Downdraft table. This is a simple device that I built based on the Bill Pentz design (http://billpentz.com/woodworking/cyclone/Downdraft.cfm) using pegboard coated in rubber attached to a reinforced box. I plumbed with a 6″ pipe in the middle of the bottom, and now with my cyclone upgrade complete this station has adequate suction and works great. This table also serves as an extension table for my workbench as well as my miter saw, so it is a great multi-function addition to the shop. Band saw. The standard 2-1/2″ port on my band saw is borderline worthless. I have upgraded it by cutting a hole through the lower door and connecting a 4″ tool port. A 6″ port would be better, but I was concerned that it would be in the way as I operated the tool. More dust could be gathered by configuring an additional hose connected to the 2-1/2″ port which is currently sealed with duct tape to optimize collection through the 4″ port; a project that is on my to-do list. I hope that in the years to come our tool suppliers will do us a service and include better dust extraction in their tool designs. Some vendors are starting to show progress, but most have a ways to go. In the meantime, the more you can do to capture the fine dust that is generated at each source, the healthier your shop environment will become. I really enjoyed you article on dust collection. I am a amateur wood worker doing things like pens, bowls and vases. I have recently had the good fortune to purchase all new equipment, lathe, bandsaw sanders, grinders and the sort. I have decided to jump into dust collection and purchased a 11/2 hp dust collector. The installation instructions suggest adding a ground wire inside the length of all the ducts to prevent static discharge. Your article doesn’t mention anything about grounding your dust collection system for static electric problems. Is this really important or a real over kill. Thanks for the comment. This was the third of three articles related to dust collection. In the previous article (http://local.wordpress/articles/projects/-d-o-g-simple-approach-for-dust-collection-ducting/) which was focused on ducting, I discussed grounding. If you live in a dry area and you have a static problem then it would be a good idea to take this additional measure. I have not had a problem in general so I have not grounded mine. Congrats on your shop setup; sounds great! Enjoyed articles. Where did you get the planer dust hood that attached to the planer? Thanks. As hard as it may be to believe, I bought a table saw last year with only a 3/4 inch dust collection port and in my disbelief I did look at the instruction booklet to verify that it was all the manufacturer planned for the dust collection on a 10-inch table saw blade. Obviously I’ve had issues with debris and dust from this set up, I’ve thought about cutting the case and making a bigger port to hook up to a 3-inch hose to my shop vac, as I am without a vacuum system or the room to even put one in my garage. Having read the information you have supplied here in your articles will soon end my table saw nightmare, as I just wasn’t sure if a 3-inch port was going to be a bit too big, or if I should go smaller. Now I at least know if anything I want to get bigger and not worry about a 3-inch port. Thank You for such great help and reading. It is important to balance the size of pipe with the CFM capabilities of your dust collector. 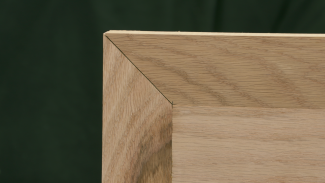 3″ isn’t great, but it is world’s better than 3/4″ (I have never come across anything that skinny before on a table saw!). If you are able to upgrade to a more powerful dust collector, then go with a bigger pipe and dust port at the tool. If you will continue to use the shop vac for a while, then don’t oversize the pipe because you will loose air speed and not be able to collect much of anything. Very good thought provoking article. I had not thought about enlarging ports or adding additional ones. Had I not read this article, I would have continued to assume that I would be ruining the integrity of the machine by altering or adding ports. Thank you for the enlightenment. Also, thank you for including the pictures, always worth so many words. One thing that ‘may’ help you with the band saw (and other tools too), is to add more of that foam tape to the door joints. Also, you may realize, but many may not, is to use a closed cell foam tape vs. the more common (and usually less expensive by a marginal amount) open cell tape. I put the various tapes up to my mouth and try to blow out.. If you can not get air out, then it’s a closed cell tape… The closed cell tapes will make a world of difference in sealing out the air around door seams and various other openings, as well as increase the efficiency of the collection system. Thanks for the article(s)… heading over to one of the other ones now. Thank you for the ideas, especially the Drill Press. The greatest challenge for me has been the hoses; they are heavy and pull out of place from their own weight and bulk. I’ve tried all kinds of clamps but never thought of a Bungee! (Doh!) Keep it simple, right? Big thumbs up!